or order online with PayPal. Danny Raynor is sick of foster homes and he's frustrated by do-gooders who--quite legally--are breaking up his family. Against a backdrop of the 1970s Indian activism, Danny struggles through his feelings of inadequacy and anger as he is forced from one foster home to another. Adoption plans are in the works for his younger sister, and he knows she doesn't want to be adopted. On top of that, his older brother seems too caught up in Michigan politics to be of any help. He has to take matters into his own hands, and in doing so, he learns how to remain true to himself. 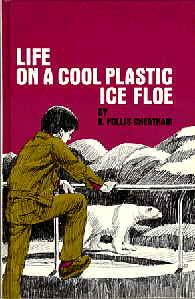 The story Life on a Cool Plastic Ice Floe, developed from my involvement in American Indian rights efforts of the 1970s. I escorted a young man from a juvenile detention center to an American Indian function one fall. There, while listening to his native language and hearing about the old ways, the boy (we'll call him Jeff) cut out on me on the pretext of going to the john. I was miserable until three A.M. when they called from the center and told me he had hitchhiked back there. The counselor didn't believe me when I related how distraught Jeff had become when hearing his own language and talk about his home rez. The man said that was nonsense--that Jeff never talked about home and all the counselors were certain he didn't want to return to the large, poverty-ridden family he was from. I couldn't help but remember the difficulty Jeff had in telling about his family when I asked, and the discomfort of being the kid from the detention center . After two weeks I was told he had been sent to a foster home 200 miles away. A lawyer friend who worked with social services tried to keep track of him. Jeff kept running away and was placed in five different homes before he vanished ten months later. I've never forgotten him. I've always wished I could tell him I was sorry that I didn't do more. In some ways, this book is to make amends.